Ravi Jain’s new play Gimme Shelter is unlike any of his previous work. Motivated by the coming threat to millions of people who will be displaced by rising sea levels, Jain performs a dance drama based on the ancient Sanskrit epic the Mahabharata to bring home to us the loss of entire cities and countries. The work is a compelling synthesis of storytelling, movement, scenography and video projection. Jain begins the 55-minute-long play by telling us directly about its background. He was struck by a photography he came across of a boy holding up a sign reading “To the rest of the world please could you prepare a place for my country to stay”. He discovered that the boy lived in the Pacific island nation of Tuvalu, the average elevation of which is only six feet above sea level. Scientists predict given the rate of rising sea levels in 50 years the country will be uninhabitable. One of the country’s islands has already become submerged. Jain states that by 2010 there will be seven million people in the world who are climate refugees. Jain stared into the boy’s eyes trying to read his achievements and fears. The question that plagued Jain was how to make people care about what will be happening to people so far away. His solution was storytelling. He mentions how his great-grandfather would tell stories bending the same elements to emphasize the different points he wished to make. 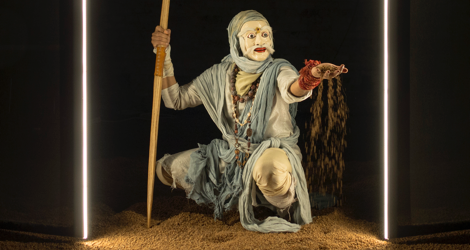 With this, Jain abandons his microphone, and uncovers a costume and an East Indian full-face mask hidden in the red gravel that covers the rectangular playing area. For the rest of the play, Jain mimes and dances to a voice-over of himself narrating a story based on characters from the Mahabharata. In his mask Jain plays all the characters. Following his great-grandfather’s practice, jain adapts the epic for his own purposes. Here he conflates stories related to Arjuna and to Duryodhana, the heir to the blind king Dhritarashtra. In Jain’s story both cousins are instructed in the art of archery by the guru Bhishma. Arjuna is destined to be a great warrior and Duryodhana is destined to be king, but whereas Arjuna is willing to learn the philosophy behind archery, Duryodhana is not. Impatient with Bhishma’s refusal to teach them until they are mentally ready, the two cousins leave him to practice archery on their own. They set themselves ever more difficult targets until one day they choose a target neither can hit. They are surprised when an arrow comes from nowhere to strike it down. The archer turns out to be the low-caste boy Ekalavya, who has learned archery by watching the cousins practice and has become a greater archer than Arjuna. In his own addition to the story, Jain has Duryodhana tell the boy that he may join them if he swims over the river to the bank where they are standing. Duryodhana says this knowing the river is too dangerous, and Ekalavya plunges in and drowns. In his introduction, Jain has told us that he given the boy from Tuvalu the name Ekalavya. When Duryodhana’s father dies the cousins return to court and Duryodhana becomes king. in a variation of the famous “Game of Dice” that sets off the major events of the epic, Duryodhana challenges Arjuna (in the original it is Yudhisthira, Arjuna’s brother). In the game, Arjuna gambles away everything he has, including his freedom and he and his entire clan of the Pandavas are forced into exile for twelve years. On day while in exile the Pandavas have to cross a lake wherein the souls of the drowned stare up at them. It would help make the narrative tighter if Ekalavya were one of these souls, but Jain does not mention him. Arjuna and the Pandavas can pass over only if Arjuna answers corrects the questions put to him by the guardian of the lake. One of the key questions relevant to Jain’s topic is: “What is the main challenge in action?” The answer: “To see others in all one does”, a variation of the Golden Rule. Jain leads the story to an impasse between Arjuna and the Pandavas and the pursuing Duryodhana and his rival clan of Kauravas, where the Pandavas are floating in the ocean and the Kauravas are on land. Ken MacKenzie has created an alley set for the Tank House Theatre in the Young Centre with Jain gravel-covered playing area in between the two seating areas. Jain, removing the mask, asks us to recreate the scene on stage by choosing a stranger from the opposite side whom we will have to decide to save of let drown. The exercise is very much like those used in encounter groups in the late Sixties and early Seventies and is still unnervingly effective. The point, as made by the guardian of the lake, is whether we can het a complete stranger drown if we are able to be human enough to see ourselves in all other people. The play is impeccably performed. MacKenzie’s set includes two hanging screens that Jain moves or that can move by themselves. Onto these screens are animated projections by David Leclerc in the style of shadow puppets that represent Arjuna, Duryodhana and Ekalavya and move in response to Jain’s narrative. The edges of the two screen are stripes of LED lighting so that Jain can light one screen with the edge of the other or create patterns by spinning the lit screens. Arjuna’s exile is depicted in a long dance to Gurpreet Chana’s beautiful music where the two moving screen frame Jain’s dancing to illustrate his isolation. The silent person-to-person encounter that ends the show has such impact in itself that one tends to forget the story that led up to it. In fact, however, it is Jain’s story that lends the encounter its impact because he creates a situation in which we not only meet strangers but are made to feel responsible for them. Will Jain’s drama make people more responsive to the plight of future climate refugees? The cynical side of me thinks that people show an amazing ability to learn nothing if they so choose. The hopeful side of me thinks that those willing to give themselves to Jain’s storytelling and interpersonal experiment will discover wells of empathy in themselves they might not have thought existed. In that way, Jain’s drama can bring about a revelation. Photo: Ravi Jain. © 2015 David Leclerc.